The Square was originally a grass covered 'towne place' around which the invading Saxons sited their settlement, circa 700AD. The Square in the 1930's. Today the great quadrangle, measuring 150 yards by 50 yards, has been easily adapted to modern needs. By arrangement with the Parish Council, Devon County Council assumed responsibility for the maintenance of the Square in 1961, when it was also given a tarmac surface. 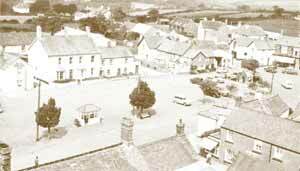 The Square, viewed from the church tower in the 1960's. Situated on the Square are a war memorial, a pump-house, a bus shelter and a telephone kiosk. 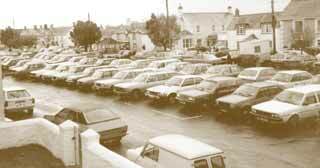 The Square full of cars in the mid 1980's. Notice the old bus shelter is still there. The first trees were planted on the Square by the Coronation committee in 1913. These were replaced by Mr. Elliott in 1936 with 3 Cornish Elm trees. Protective palings were erected at the same time. The Square, viewed from the church tower in 1995. This was taken during the VE Day celebrations - hence the 'V' of the tables. A road enters the Square at its south-east corner, runs along the east side of the Square past the Inn and a number of houses, then continues out of the north-east corner of the Square. Another road crosses the Square just below its north-east and north-west corners. The edge of the Square with the War Memorial and the road leading to Lower Village in 1959. 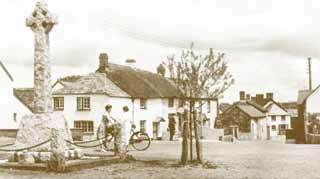 The Square is bounded to the north, west and south by shops and houses.